Need Help With Your Sign? We Can Help! The best signs come from Sign-Tech Electric. Affordable signs for small to large businesses. Your electric sign specialist in Seattle. Sign design, fabrication, installation, maintenance, and repairs. 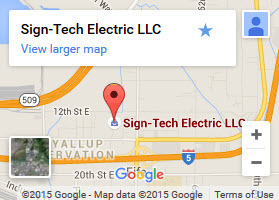 When you're looking for the most capable signs Seattle has to offer, nobody beats Sign-Tech Electric LLC. We've been leading the way for installing and maintaining outdoor and indoor signs for more than 20 years. That's because we offer a full range of services that include sign installation, manufacturing, and maintenance. When you need custom signage, you expect the highest quality. Our designers, craftsmen, and installers can create strong and reliable neon, electric, and custom material signs for indoor and outdoor applications. A custom sign that stands on its own won't last without the best in materials. That's why every sign we build is made to order, and we use the right materials for the job. Outdoor signs are built to stand up to inclement weather, UV radiation, and surge damage. Indoor signs are made to fit your business, and material choices can be adjusted depending on placement and anchor needs. Our specialists set the standards for Seattle sign companies. We don't just utilize a single individual to a build our signs. Experience makes all the difference, and that's why we use specialists every step of the way. Our team of knowledgeable designers, fabrication experts, and electricians are industry veterans. They know how to create a durable sign that looks great and lights up your business any time of day or night. Our professionals go the distance, ensuring you get the strongest neon signs that are built to weather even the wettest days. Your search for comprehensive sign companies Tacoma businesses rely on is over. We only hire journey level electricians ensuring the inside of every sign is as strong as the outside. We provide complete installation, removing the guesswork and risk of injury. Our experts can safely, efficiently, and correctly install your sign for the best viewing experience and security. With a full fleet of crane and bucket trucks, from sign creation to installation, call (253) 922-2146 or Contact Us for one of the most trusted sign companies Tacoma has to offer. © 2019 Sign Tech Electric LLC. All Rights Reserved.